I could eat pizza all the time too! I love your wonderful Pizza soup. What a nice soup to make when it is cold outside. I like all the ingredients. I will have to try and make this! Now this sounds like the soup of my dreams!!!! This looks so delicious! Need to try! We have pizza night every Friday and as part of my 2015 goals I have been looking for healthy alternatives and this is just perfect!!! Could totally devour this on a day like today…..brrr. This does look good. Not sure hubby would like it but maybe we’ll have it when he goes to NF to work for a week! Great to have more recipes to enjoy as a treat. 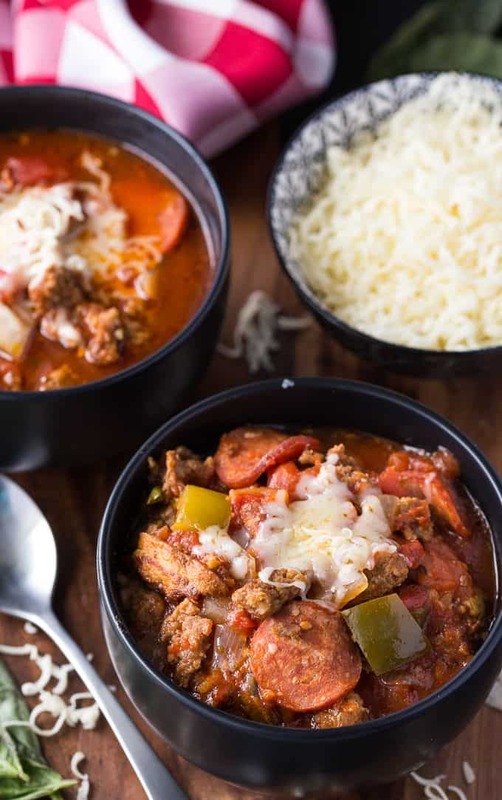 The good news is this looks CRAZY GOOD – the bad news is I don’t have a slow cooker… but I think a low simmer would be good on a cold day like today. Guess what’s for supper tomorrow night?!?!? 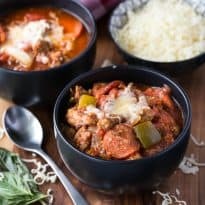 I’ve seen lots of pizza recipes but never soup. Yummy…especially on a cold winter day after simmering in the crock pot. Easy to get creative with toppings, too. Maybe a bacon and hamburger one time then a pepperoni and jalapeno another. Thanks. It would depend on which veggies looked good at the grocery store or were on for a good price. I would probably have onion, bell peppers, mushrooms, and spinach for sure. Broccoli, asparagus, and zucchini would be nice additions, but probably just one of them at a time. I would put Italian sausages and olives! This looks delicious. 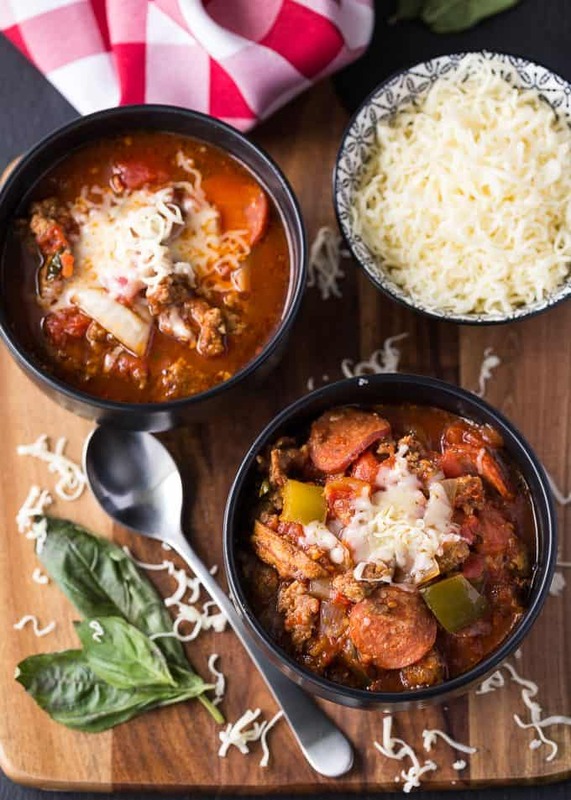 Pizza in soup form, I can’t wait to give this a try. I would top my pizza soup with cheese. Thank you for sharing this recipe. That looks very yummy. Knowing me, I’d add some anchovies at the end with the cheese. This sounds delicious and I can’t wait to try the recipe. So very clever and awesomely good! Yum! I like pineapple pizza..not sure about that in soup but this looks good! I just finished making this soup. It smells and looks awsome. I added mushrooms and black olives to the soup also. I cant wait until its finished to have some. Brilliant! My family will love this. Pinning – thanks so much! That looks so delicious and comforting! Thanks for linking up with SNF! Pinned to our party board! 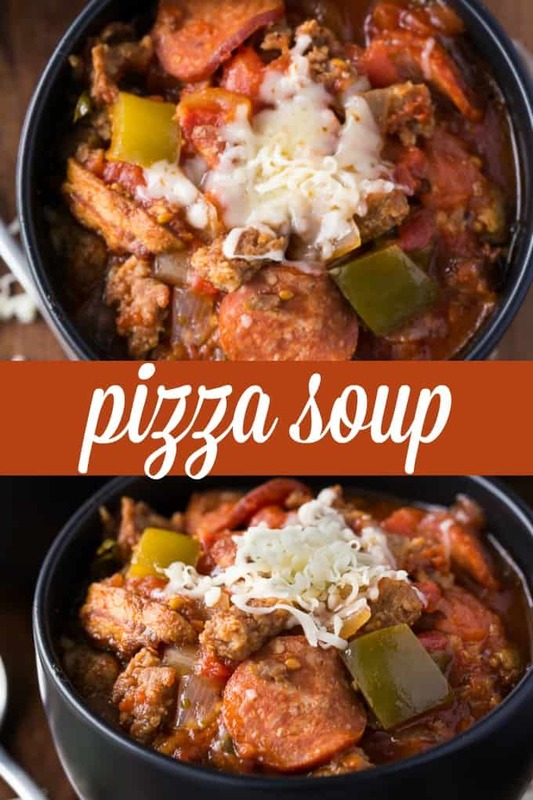 Pizza Soup is a great idea! My son would love the bacon. I think I would also add mushrooms! Will have to try this, Stacie. Thanks for sharing! Im going to make this tomorrow and I am going to add mushrooms to the soup. We have a granddaughter who will only eat the topping of the pizza. This is going to be quite a treat for all of us! I have thought about adding the mushrooms, too. But may add it later to the slow cooker such as 15 minutes. For those of us who like the bread….Italian crusty bread on the side. 🙂 Thank you for this treat! It was your recipe that inspired me to make Pizza Soup; in fact I made it again today. I don’t have a slow cooker so I found a similar recipe for the stovetop. Love it!! It is so delicious. 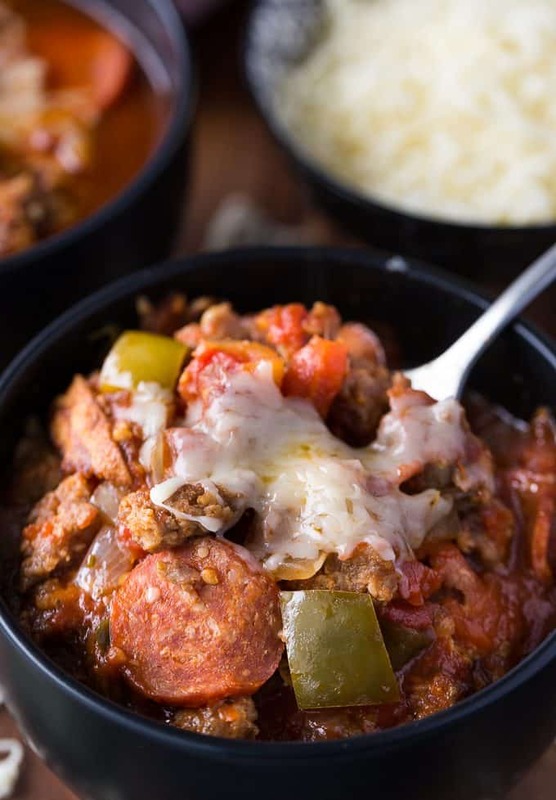 I LOVE pizza and I LOVE using my slow cooker. What a winning combination. I can smell it already … and I haven’t even bought the ingredients yet LOL. This is a “must try” for these cold February days. This soup looks so delicious! I am going to try coming up with a meat-free version by adding an assortment of veggies! This sounds great! My daughter loves pizza but haites soup a bit of best worlds might change her mind tho! This soup sounds delicious, but I would not add red pepper flakes or the green peppers. I would probably add some cayenne for a little heat. 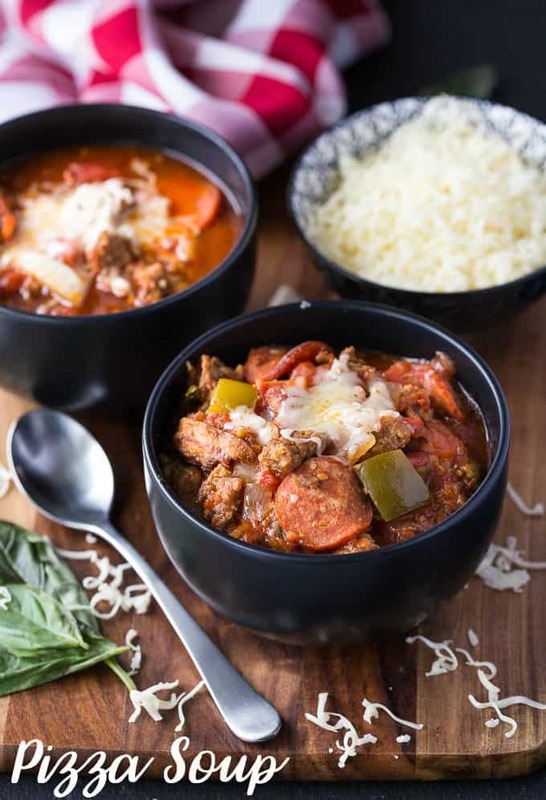 I can’t wait to try this recipe…it combines two of my favorite things, PIZZA and my CROCKPOT…HOORAY!!! I finally seen pizza in soup, and it looked so good, I copied the recipe. I’m making this Wednesday, and thank you for the share. I’ve updated the recipe – sorry about that! It’s four servings. I was wondering if putting pepperoni in this soup would make it too greasy? Thank you! It didn’t seem too greasy to me! If you are worried, you can leave it out and it would still taste good.